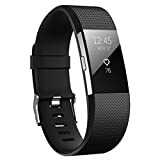 High Quality Material-interchangeable accessory bands for Fitbit Charge 2 is made of flexible and durable TPU material with stainless steel buckle,which makes the band easy to install and remove. Pratical Function – our classic replacement bands for Fitbit Charge 2 are sweat,rain, splash and water resistant, intended for high intensity workouts. Different size for men and women. Replacements for the Original Wristbands, great as a Spare, or even a gift. 2016 Fashion New Replacement soft TPU Band (No tracker) for Fitbit Charger 2 Heart Rate Fitness Trakcer Wireless Band Wristband Bracelet. We are the manufacturer of Hanlesi products, all of them are designed/improved by our experienced and professional team. We are striving to maintain the highest quality standards for your ultimate buying experience. Please feel free to send us an email if you have any question regarding Hanlesi product or service, we are glad to be here to help you. Also, we are welcome for any of your suggestion, your trust is the driving force of our progress.